French folklore tells a story about Captain Cook stumbling upon the long island now called Grande Terre, in New Caledonia, when he was on his way to discovering Australia. In his haste to find the latter, he departed New Caledonia’s pristine waters without hoisting the Union Jack, thereby missing the opportunity to claim another jewel in the crown for the Queen of England. Alas for the Brits, the deed was subsequently done by the French, who relocated some of their convicts there to build a nation that has subsequently become rich in the cultures of both France and Melanesia, while its mountainous terrain produces quality ore, from which nickel and chrome are extracted. Cook certainly dropped the ball on that one – but all is not lost; New Caledonia is only a short flight away from the central east coast of Australia. In fact, a flight takes under two hours from Brisbane and three from Sydney. The other aspect of New Caledonia (and the one I went there for) is the incredible world-class sport fishing. It’s so good, in fact, that this was my fourth trip there. The local Kanak traditional owners are of Melanesian descent and farm local produce on small lots dotted over the countryside. The east coast has a high ratio of Kanaks in its population, who live in clusters hugging a coastline where the mountain bases stem from the rocky shoreline. This side of the mountain range has very little flat farmland and is draped in thick jungle that hides the inhabitants, who use the high rainfall to their farming advantage. The locals also have access to brilliant fishing. All along the coast, small craft ply close to the shore. Being the subsistence fishers that they are, enough to feed a family is caught in quick time. The west coast is where many of the released convicts settled and where their ancestors and other free French settlers made their home. It has extensive deltas running the length of the island, from the mountain bases to the gin-clear waters of the biggest lagoon in the world. That expanse of water is hemmed in by a barrier reef second only in size to what we have along the Queensland coast. But I was there for the fish and planned to use the services of a local charter company. Upon arrival in New Caledonia, I met my fishing guide, Etienne Picquel. Etienne’s custom is to fish in a number of areas around Grande Terre, the cigar-shaped main island. Each of the locations he fishes has multiple species on tap and varying geography that allows for fishing through differing seasonal weather. In this way, Etienne ensures that he’s not over-fishing any one area. From the airport, Etienne’s first stop was Ouano, about one and a half hours’ drive north. Ouano is a surf camp, with rustic timber cabins, a bar and dining facilities perched on the beach fronting expansive shallow flats that lead out into the lagoon. The distant roar of surf reminds you that there are some big curls outside, rolling onto the reef, about 10 to 20km from the mainland. Swell permitting, you can get outside via a break in the reef and watch the depth sounder spiral out of control as the bottom drops away from 30m to thousands within a few kilometres. This reef gap, and others, are usually attended by flocks of birds working the schools of surface-feeding yellowfin tuna, Spanish mackerel and other pelagics, while below, the tooth brigade, in the form of dogtooth tuna, red bass, jobfish in green and rusty models and other ooglies pick up the crumbs. If going outside is not an option, all-weather fishing is available within the lagoon, which varies in depth to 20m and is bespeckled with sandy quays and islets along its length. On one trip, we had constant 20kt winds, but the lagoon was still comfortably fished, with excellent results. It’s no easy fishing though. 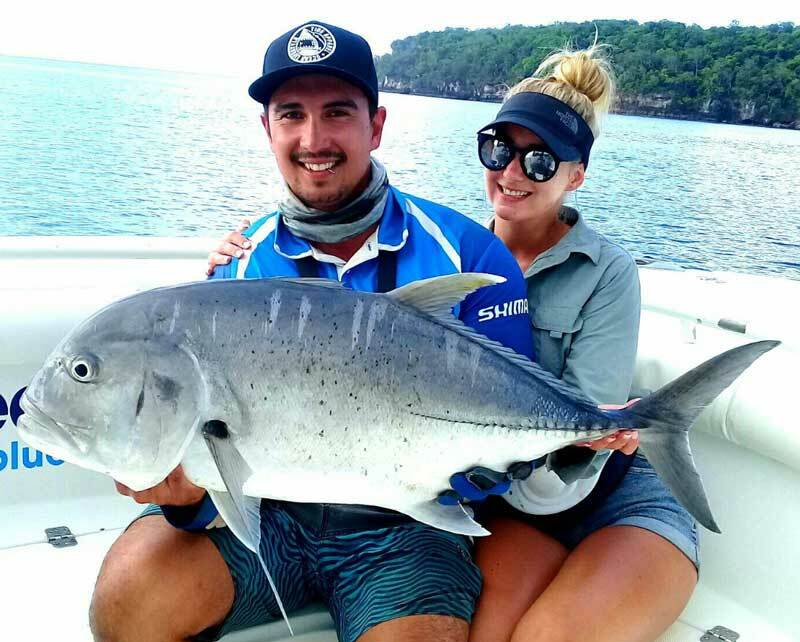 Some of these fish are in the serious end of the weight-and-size scale, with giant trevally (GT) of 40kg relatively common. 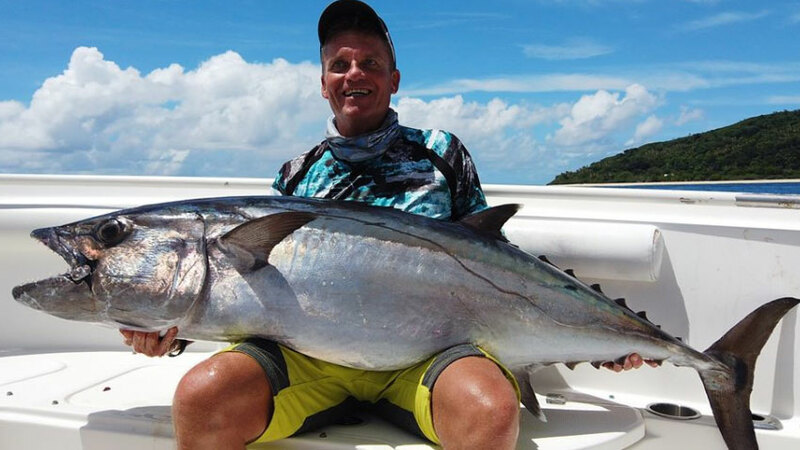 I have seen New Caledonia GTs that weighed 55kg. And if it is not the size and number of the fish that wear you down, it’s the calibre of the tackle needed to take them on. Try the biggest and toughest spinning reels available, loaded with 80 to 100lb braid, 300lb trace line and split rings that still spread under the extreme pressure. Then there’s the 5/0 Owner treble hooks that fish bend, but you can’t, cast the biggest poppers available on the retail market. Suffice it to say, you might need some pre-trip gymnasium training to help maintain stamina. The upside is you will be fishing ‘gentlemen’s hours’ – 7:30am start and pulling the pin at 4:00pm seems to be the norm, something which seems to suit the average angler’s stamina. But all is not lost if you’re having trouble hacking the pace in the big league. 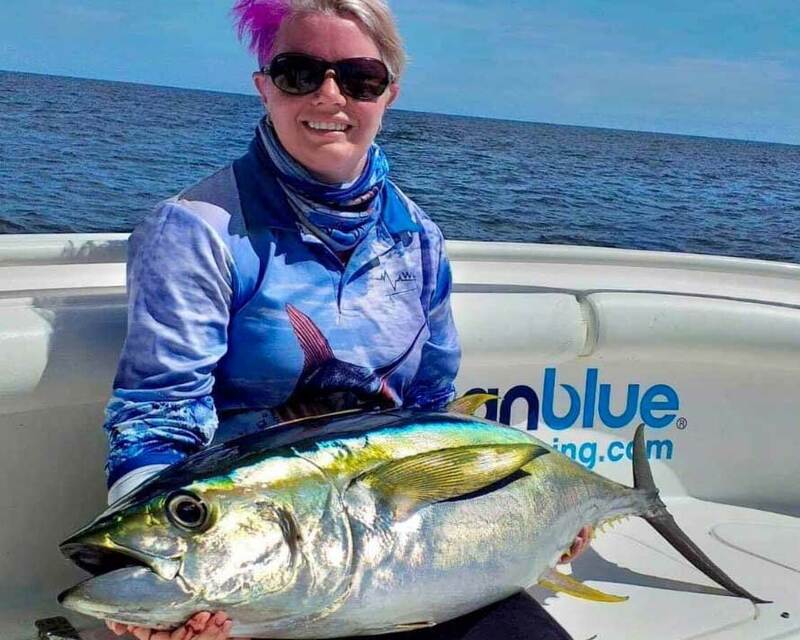 The light-tackle prospects throughout this country are also world-class and anglers can fish as light as they like and even take to the healthy bonefish population to the north, with long wand and fly. Back on the road, and an hour north from Ouano, we turn off the main drag at Bourail and a few minutes away is Nekweta Surf Camp. This unique Melanesian-style camp is set on a block a street back from the beach and from here Etienne accesses the pristine waters out to, and past, the reef system. As well as having runs on the board for big GTs, this area is also a haunt for barrel-like yellowfin tuna at the right time of year. My recent visit there turned up heavyweights from the coral trout family as well as GTs averaging 30kg, with the biggest nudging 50kg, plus the usual line-up of big cods and emperors keen to put a dent in our tackle supply. Most of the stunning gin-clear water we fished was only a metre to two metres in depth. It really is spectacular fishing when you get such big fish smashing surface lures right before your eyes in such a pristine environment. Equally fantastic is the hospitality shown to visitors by Stephanie and Manu, who built the Nekweta Surf Camp. Manu’s ancestors were convict settlers in New Caledonia and his knowledge of the country’s history and its ties to the Melanesian community are fascinating. The bungalows are built along traditional Melanesian styles, with a heavy accent on open living and richly-carved timbers. I felt embraced by the culture at Nekweta; it really was a highpoint of my trip. Back on the road again and travelling north up the west coast of Grande Terre, I arrived at Malabou near the tip of the island. Perched on a calm beach in the shelter of islands that spread out into the lagoon, Malabou Resort is Etienne’s fishing base. 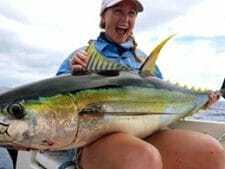 I had the pleasure of spending a week there in 2008 and experienced the most amazing fishing ever, with sizeable GTs, yellowfin tuna and a whopping wahoo of 59kg on a spin stick! 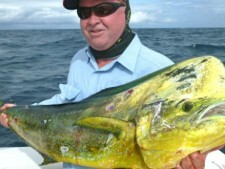 That was on top of jigged dogtooth tuna, puka-puka (rusty jobfish) and big groper from the shallow bommies. The bonefish flats are just 20 minutes drive from Malabou and, standing in the crystal clear shallows, the pristine islands to the north, that are yet to be explored by lures and poppers can be seen. In 2009, Etienne established fishing at Poindimie, on the eastern coast of Grande Terre. It is the most densely populated community about midway along the island’s length. The reefs on this side of the island are broken up by large navigable passages between, offering more fishing around their circumferences than the long, unbroken strips of reef on the west coast. We had heard rumours about the quality of the fish on this side of the mountain range and were not disappointed, with GTs to 55kg (they were the ones we could land, there were bigger hooked that we didn’t) and various species of coral trout in plague proportions. 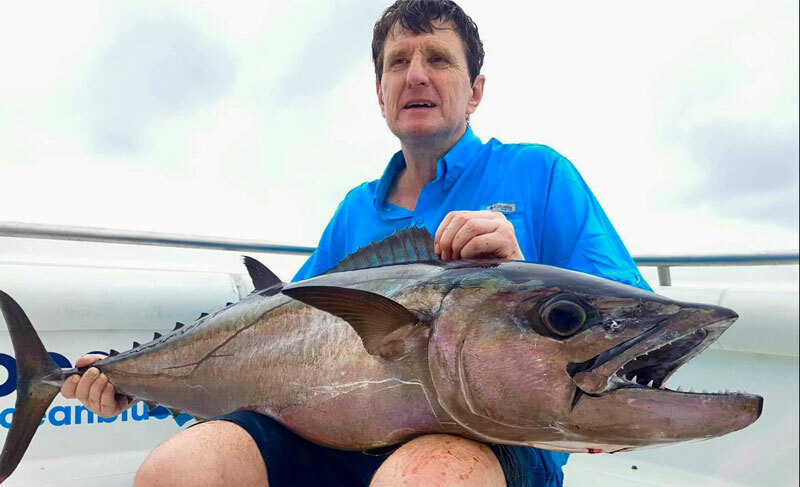 There were Spanish mackerel to contend with, along with rainbow runners, a variety of cod species, and different members of the emperor family. It is also shark country and on occasion, it was a battle to wrest a hooked fish away from the toothies! We won nearly all of those fights, with only a couple of specimens filling spaces in the food chain. Tera Tieti Beach Resort was our base camp for the Poindimie section of the whirlwind trip. Just twelve months old, Tera Tieti is constructed in a Melanesian theme, with a swimming pool overlooking the ocean. The bungalows and other buildings are joined by elevated timber decking that meanders its way above the grassed sand that runs down to the beach. Etienne says he sets up his charter activities so that, no matter the weather, there is a good option somewhere around the island where clients can fish in relative comfort. 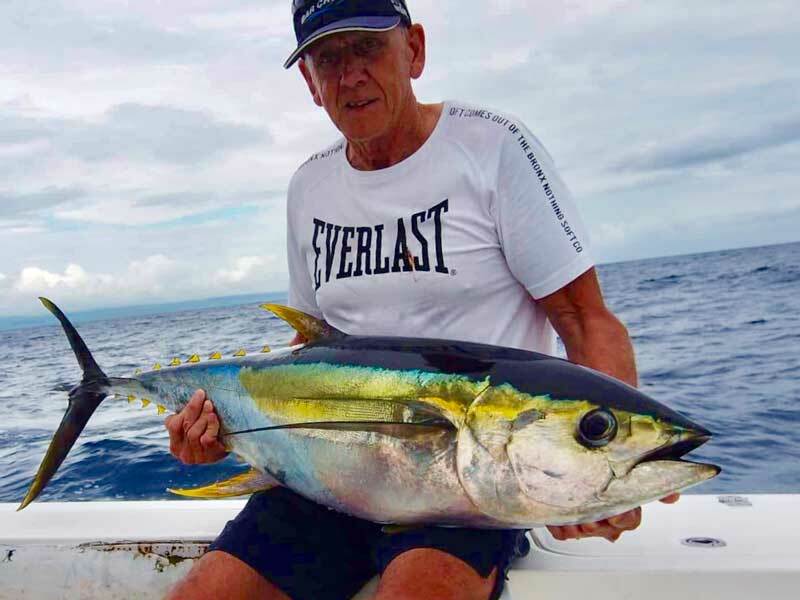 An example was a five-day jaunt out of Ouano, when four of those days blew a steady 30kt around the clock, which would have kept most anglers land-bound back on Oz. Not a problem here, though. We fished every day behind the reef in half a metre of wind chop, while five-metre-plus swells crashed over the outside of the reef. The fishing was still brilliant, with a similar catch rate and the species tally to previous trips in becalmed conditions. So what else is there to like about New Caledonia? Lots! Partaking of the French cuisine rates near the top of the list and the island-grown beef is the best I have ever tasted, especially when enjoyed with some of the Bordeaux wines that can be bought at the local supermarket. If you’re a history buff, there are museums in many of the larger towns and, of course, if you want to ride world-class surf, this is the place to do it. Three golf courses in the southern half of the island will help keep you in the swing of things and if you’re feeling fit, there are specific trekking trails all over the mountains that will keep you in the fresh air. As well, there is diving, snorkelling, jet skiing, kayaking and sailing. 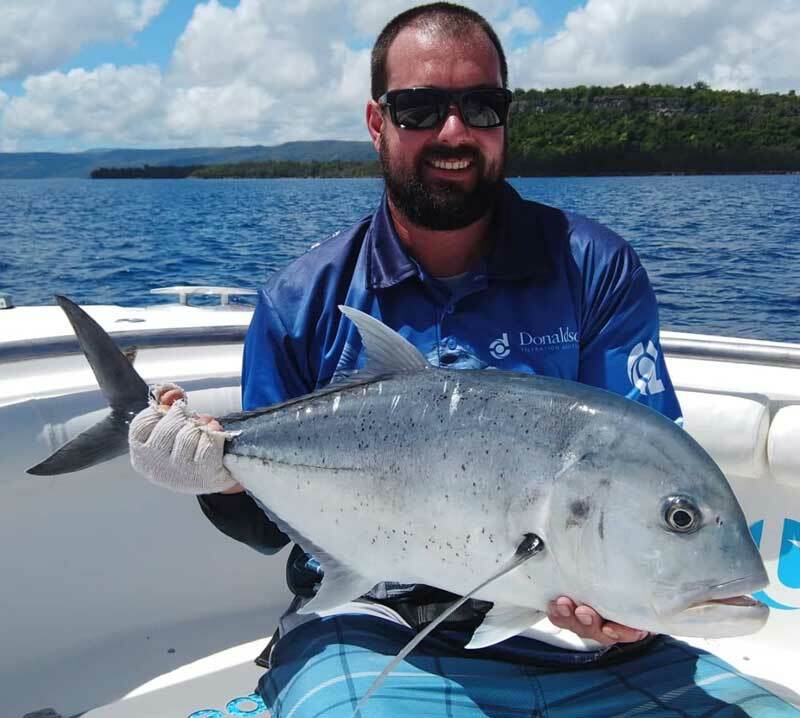 New Caledonia: big on everything, fish included!